The Florida Public Service held its last Commission Conference Agenda Meeting for the year on December 18, 2014. On the Agenda were two important items for Florida ratepayers – the challenge to FPL’s smart meter opt out fees and the inclusion of FPL’s oil and gas exploration (fracking) investment in the rate base for recovery through the fuel clause. The Commission meeting and the following Internal Affairs meeting was more of a love fest than a meeting, as they each gave their lengthy send off remarks for two members of the team – Commissioner Balbis, who chose not to seek another term and FPSC General Counsel Kirk, who is retiring. Balbis gave a speech of his proud accomplishments of his four years claiming customers have benefited from a “stable regulatory environment”. He bragged about the goodness he sees in the controversial nuclear recovery costs clause stating it has saved $3 Billion in fuel costs and took the equivalent of 7 million cars off the roads by removing carbon emissions. The biggest chuckle I got is when he thanked his colleagues “for their patience with me asking a question of every single witness”. This is a lie and I can prove it. On September 30, 2014 in that same very room, almost 3 months ago to the day, I was sworn in as a witness in Docket 130223, was given a paltry 3 minutes to summarize my pre-filed testimony, and then when it was time for questions not one Commissioner or their staff asked one question. I guess the cat got his tongue that day. Docket No. 130223 is FPL’s smart meter opt out fees, which I filed a formal protest against on February 4, 2014. Staff issued their recommendation a few weeks ago calling for a couple of adjustments that would reduce the upfront fee from $95 to $89, a whopping $6. Staff ignored many of the arguments before them; instead their analysis just parroted what FPL said. I’ll write in more detail about that another day, particularly how they doubled-down on an incorrect adjustment in their latest recommendation. A few days ago I received the Conference Agenda for todays meeting. Of the 15 items on the agenda, all but three had double asterisks beside them, denoting they would be handled as consent agenda items (no discussion). I was relieved to see that Docket 130223 did not have such asterisks, so I expected at least some discussion. Wrong! I guess Commissioner Balbis had run out of questions – for at the start of the meeting they put the smart meter docket into the consent agenda pool. (They have a lot of discretion to do as they please.) The staff recommendation was quickly rubber stamped and approved with no discussion. FPSC General Counsel Kirk’s love fest speech talked about the dysfunctional Commission of 5 years ago and their “lack of civility” and how much better it was now. He bragged about how the FPL settlement appeal win was a huge decision. In the electric utility market he predicted change similar to that of the telephone industry. Citing his work as a state legislator, he reminisced about his legislation to bring forth peak load pricing. Then he did a no-no. He let the cat out of the bag. He said that the investment in smart meters would now make peak load pricing easier. I guess the truth always comes out eventually. The Commission also took up the FPL fracking investment issue. This was the fun theater of the day. The script was written in advance to put Balbis up as the chief proponent of this project. Why, you ask? Well, because he is leaving in 12 days, of course. If it goes sour in the next few years, you can point to the man that is no longer there. Each of the others brought up their hesitations pretending to put up some resistance and thoughtful oversight – the contract term is too long, the accounting might not be transparent, who will do the audit? The best actor award will go to Brise. There were four issues/questions being considered. The first one they tackled was Issue #6 – whether the 2012 rate case settlement agreement precluded FPL from seeking to increase rates as it proposes. 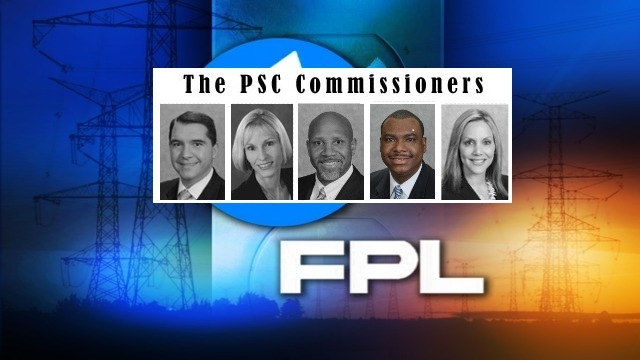 When they voted on that issue, Brise voted Yes – meaning that he believed the settlement agreement precluded FPL from seeking rates for this issue. All the other Commissioners voted No. Edgar so concisely stated before the vote why they were taking up Issue #6 first. Because if the vote was that the majority of the Commissioners felt the settlement agreement precluded this increase, then the other issues are moot. So how did Brise vote on whether to allow rate recovery for this proposal after the first vote? Well, he concedes he lost the first battle and then votes in line with the others to unanimously approve all the other issues. What? Yes, he believes the rate case settlement precludes FPL from seeking rates on this investment BUT he believes the Commission should approve FPL’s request for cost recovery. Folks, that is what is meant by “civility” – getting along, showing solidarity is much more important than the facts and your convictions to how you see the facts. There are other supporting actor awards to give out, like Brown’s statements of prudency. She poses very important questions regarding risks for rate payers if state legislators act unfavorably on fracking, for which the legal staff answers, after a long period of silence, “I don’t know” and then she smoothly doesn’t seem to care that she doesn’t get an answer and powers on and votes for it anyway. Once I figure out how to get video clips off the site, I think I can make a pretty good award video. Not to be out done, they had a rival love fest today in California too for their outgoing Chairman Peevey. He was caught up in just a little scandal of participating in judge shopping for the California utilities. One would think that little event, discovered through freedom of information requests for e-mails, would get you fired for ethic violations. But no, he got to keep his job until the end of his term and throw himself a love fest. California, after a three-year review, also voted today to keep their smart meter fees that were being challenged by the public. But at least they had discussion AND public comments on the issue, unlike the Florida cowards. TALLAHASSEE, Florida -- Not everyone is on board with Florida Power & Light's move to the smart grid and smart meters. Thousands of FP&L customers opting to keep their standard meters pay hundreds of dollars in extra fees. Now, lawyers representing them are calling on the Public Service Commission to force FP&L to reduce the charges. The utility service started installing new smart meters to all households back in 2010 and then early this year rolled out fees for customers who don't want them. That's costing them a one-time $95 enrollment fee and a $13/month charge. "Smart meters, you can read them remotely, so theoretically you save money not having to have meter readers, but when you're not delivering those savings then who really profits from this? It's FPL," said Nathan Skop who represents one of the FP&L customers complaining. An FPL spokesman said the smart meters improve service, help them maintain the lowest residential electric bills in Florida and provide customers with more information. He also said less than one percent of customers opted out of using smart meters. The PSC could make a decision on the fees by early November. On April 1st the Athens Medical Association (AMA) held a Scientific Conference on “Non-Ionizing Radiation and Its Effects on Human Health” at the Athens Medical Association Building, Athens, Greece. Scientific lectures were followed by a discussion, then the Athens Medical Association decision to issue 16 recommendations to reduce human exposure to wireless radiation. The speakers contributing to this event were Dr. Theodore Metsis, a Mechanical, Electrical, Environmental Engineer, electro-smog specialist and author of the book “The Radiation of Technology”, Dr. Stella Canna Michaelides, Chemist, an expert on environment and health and President of the Cyprus Committee on Children’s Health and Environment, Stelios Zinelis MD, Vice President of Anti-Cancer Society of Cephalonia and Ithaka, Dr. Lucas Margaritis, professor of biology at the Athens University and lawyer Maria Flouraki. Coordinator of this event was Mr. Sotiris Rigakis MD, Honorary President and Past President of the Athens Medical Association. George Patoulis MD, President of the Athens Medical Association, said that AMA, in emphasizing its role and duties as guardian for public health, has taken steps to encourage and promote this open discussion dealing with the delicate issues of electromagnetic radiation. Mr. Patoulis stressed that all local authorities and all medical associations are obliged to adopt and apply the best possible practices available in today’s world, aiming primarily at the protection of our fellow citizens. In the general scope of the discussion under the title “Non-Ionizing Radiation and Its Effects on Human Health”, Professor Margaritis presented his recent proposal to the Ministry of Digital Affairs, a document that highlights health issues associated with wireless communication and the elevated levels of radiation in our modern society. Dr. Stella Canna-Michaelidou presented the steps adopted by the Cyprus Government for children’s protection. She stressed the strong scientific evidence, special vulnerability and exposure of children and the risks from wireless communications and radio frequencies in all devices used by them. She called for awareness and education among health professionals, teachers and parents, and for new legislation or biological criteria to evaluate at least children’s exposure. Avoidance of mobile phone and WiFi in homes, schools, pediatric clinics, nurseries and playgrounds by children under 14 is necessary. Dr. Metsis, among other health issues of wireless communication presented, emphasized the constantly increasing levels of radiation recorded today in many built up areas and cities—levels at which many doctors and scientists repeatedly raise alarms—the rising issue of electromagnetic hypersensitivity in a large number of citizens in most western countries, the setbacks of smart meter installation in private homes already exposed and the dangers of the completely unknown elements in the terahertz frequencies used in the new 5G technology. In concluding this discussion, the Athens Medical Association agreed to issue and endorse a 16-clause recommendation, leading to safer use of the wireless communication in our everyday life. This press release is adapted from the Athens Medical Association press release. This is one of Lakeland Electric's Sensus remote-disconnect smart meters. The meters are being replaced because of the chance they may overheat. Published: Friday, August 29, 2014 at 11:07 p.m.Last Modified: Friday, August 29, 2014 at 11:07 p.m.
LAKELAND | It will cost Lakeland Electric about $50,000 in labor costs to replace 10,657 residential smart meters over concerns they might overheat. Sensus, the manufacturer of the meters, is providing new meters at no cost to the utility. However, the North Carolina company will not pay for any of the labor cost for putting them in. Lakeland Electric has paid $8.5 million to Sensus since the devices were installed in 2011 and 2012. Overall, the utility has spent about $25.5 million on the smart meter project. In 2009, the utility received a $15 million grant for the project, and $20 million came from utility bonds for the project. The decision to replace the meters comes after months of discussions between Lakeland Electric General Manager Joel Ivy and Sensus officials. Six of the meters have caught fire during the past year. The 10,657 devices, called remote-disconnect meters, make up about 9 percent of the utility's 121,000 meters. 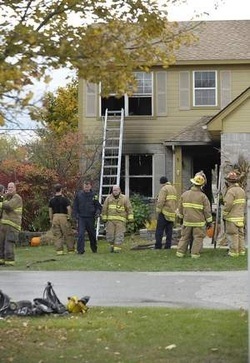 Sensus spokeswoman Linda Palmer declined comment and directed inquiries to Lakeland Electric. Smart meters faced criticism before they were installed. About 100 households pay a monthly $16.25 fee to use their old analog meters. The residents who chose not to use smart meters are concerned about government intrusion and fears the devices cause health problems. (NaturalNews) Thousands of California residents were left without power recently after their so-called "smart" meters exploded due to an unexpected power surge. 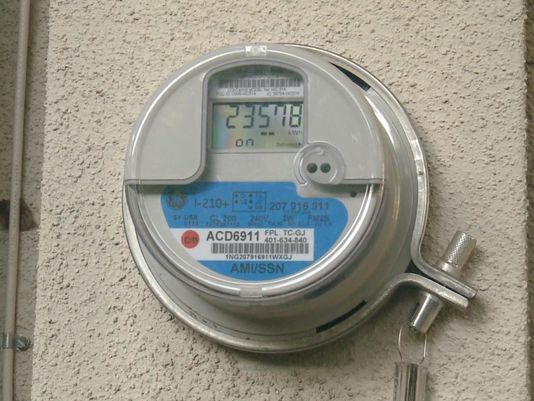 According to CBS Sacramento, more than 5,000 homes in the Stockton area were left with blackened, charred, and completely destroyed smart meters after a dump truck crashed into a nearby utility pole, pulling the static line down onto the distribution line. When the two lines intersect, stated PG&E spokeswoman Brandi Ehlers to the media, the resultant surge causes a major overload to the system. And when smart meters are involved, this overload can cause the meters themselves to pop and literally blow up, potentially causing a fire or other property damage not typically caused by traditional analog meters. "The top lines are considered our freeways," explained Ehlers. "The bottom lines are our distribution lines taking power directly to homes. So when the two collide, they're at different voltages and the higher voltage wins out, causing an overload." Do you have a smart meter? Report problems with it to the Consumer Products Safety CommissionBut this doesn't explain why the overload caused the meters to explode which, again, doesn't happen with traditional analog meters. All around the world, people with smart meters are reporting fires, explosions, electrical problems, and even burned out appliances as a result of smart meter installations, and yet utilities continue to install them without their customers' consent. "The neighbor across the street, his meter doesn't look as bad but his receptacles are all blackened," admitted Brad Abernathy, one of the Stockton smart meter victims, about the harrowing experience in California. Here's how to get rid of your smart meter, or avoid having one installed if you still have an analog meterOn the EMF Safety Network website, you can peruse story after story of fires, explosions, and deaths associated with the use of smart meters. These apparently untested devices, which we've previously reported pulse electromagnetic radiation into the walls of the homes to which they're attached, are being installed without people's consent, and without any true guarantee of safety. "One thing that has been revealed by people who've tracked 'smart' meter pulses: They are highly variable," explains the site Stop Smart Meters! "Other descriptors: Unpredictable, random, very erratic, and even bizarre. One EMF consultant has told us that it is impossible to extract meaningful conclusions about the fields created by the pulses." Among the many health effects documented in conjunction with smart meters are chronic fatigue, difficulty sleeping, leg cramps, headaches, learning problems, and more. A 2011 study published in the International Journal of Neuroscience also explains how the same kind of electromagnetic radiation emitted from smart meters can trigger novel neurological disease. Smart meters may also allow your utility company, the local government, and possibly even federal authorities to monitor your utility usage based on the extensive data they collect about electricity usage. 1) Contact your power utility directly and instruct them not to install a smart meter. If one has already been installed, order them to remove it and put back on the analog meter. 2) Contrary to popular belief, smart meters aren't mandated by the federal government, and federal law requires that power utilities provide customers with "a time-based meter" that supports "a time-based rate," upon request. 3) Attach a signed refusal notice to your analog meter saying you don't consent to having a smart meter installed. 4) If you already have a smart meter, complain to your Public Utilities Commission or utility oversight board. Livonia— Livonia fire officials and DTE Energy are investigating a fire that ripped through a home Friday while service technicians were removing an exterior meter. There were no injuries from the blaze at the house in the 28000 block of Bayberry Park Drive. The homeowner, although upset, expressed gratitude. DTE spokesman Scott Simons said service technicians were removing an old meter and installing an advanced meter when they saw signs of fire. The two-story home suffered extensive damage, according to battalion chief Jim Pietraz. “We got the call at around 12:02 p.m. when somebody called 911 and they exited the building,” he said. Initial reports said firefighters were bailing out of windows, but Pietraz discounted those accounts. “They entered through the first floor door but exited through a sliding glass door, also on the first floor,” he said. The following is a compilation of reports from the US , Australia and Canada about fires, explosions or burned out appliances due to Smart Meter installations. If you have experienced similar problems, please post your story in the comment section below. 8/2013 Lakeland fire sparks concerns about ‘smart meters’ (Florida) TV news reported , “A charred electrical box is what’s left of a very scary weekend outside Cherie Oberg’s Carillon Lakes condo in Lakeland. Oberg says the digital “smart meter” on her home burst into flames damaging two adjoining meters. The flames fizzled out by the time Lakeland firefighters arrived, but the fear sparked by the situation is still smoldering for Oberg and her neighbors.“ The report and video confirm the Consumer Product and Safety Commission is taking complaints on smart meters. A charred electrical box is what's left of a very scary weekend outside Cherie Oberg's Carillon Lakes condo in Lakeland. Oberg says the digital "smart meter" on her home burst into flames damaging two adjoining meters. The flames fizzled out by the time Lakeland firefighters arrived, but the fear sparked by the situation is still smoldering for Oberg and her neighbors. "Oh my gosh, somebody could have died. We could have all lost our homes," Oberg said. "It was totally scary," explained neighbor Sandy Williams. "We came out. There was still a little bit of smoke smell. We could smell the air way down at the other end of the building." Oberg and her neighbors are convinced the "smart meter" itself is to blame for the fire, but Lakeland Electric and city officials dispute that. City spokesman Kevin Cook says a preliminary investigation revealed the problem was not the "smart meter." "What we found is the can, the apparatus that the meter actually fits onto, that looked like there was an electrical short inside that can," Cook said. "We found out it's not the actual meter itself. It's the housing of what the meter plugs into which unfortunately is the homeowners responsibility," he said. The explanation is very similar to the one given by Florida Power & Light in 2011 when a similar situation unfolded at a South Florida woman's home. According to our partners at WPTV in West Palm Beach a fire erupted in July 2011 at a home that just had a "smart meter" installed. An FP&L spokeswoman at the time said, that this was not related to either a traditional meter or a smart meter, this was a wiring issue in a customer's home. Cherie Oberg said she was basically told the same thing by Lakeland Electric about the fire at her home. "I was told the box, the electric box isn't sufficient for the new meters, and yet Lakeland Electric put in the new meters regardless," she said. "We're trying to find out what's going on," said CSPC Deputy Director Alex Filip. He says the agency is trying to find a pattern or defect if one exists. Published on Mar 26, 2016Researcher Brian Thiesen presents shocking and disturbing facts about smart meter fires -- which your utility does not want you to know about. In this blog and in our book Game Plan, we have made a strong point that the Electric Grid must be protected from EMP, cyber attacks, physical attacks, or natural disaster. I’ve worked with Frank Gaffney and others from the Secure the Grid coalition and served on their team of experts to address this serious concern. Congress Takes Important First Step Towards Securing The Grid(Washington, D.C.): Last night, the House of Representatives approved unanimously H.R. 3410, the Critical Infrastructure Protection Act (CIPA). This legislation marks a breakthrough: For the first time in four years, Congress has acted to begin to protect the nation’s most critical of critical infrastructures: the U.S. electrical grid. It now falls to the Senate and to President Obama to ensure that the House-passed bill becomes the law of the land. CIPA’s lead sponsors were Reps. Trent Franks (R-AZ), a senior member of the House Armed Services Committee and co-chairman of the Electromagnetic Pulse (EMP) Caucus, and Pete Sessions (R-TX), the chairman of the powerful House Rules Committee. The measure enjoyed strong bipartisan support including from the House Homeland Security Committee’s Chairman Michael McCaul (R-TX), and the Chairman and Ranking Member of the Committee’s Subcommittee on Cybersecurity, Infrastructure Protection, and Security Technologies, Reps. Patrick Meehan (R-PA) and Yvette Clark (D-NY). By some estimates, nine out of ten Americans would perish if the power were to go off and remain off for a year’s time. Under the honorary co-chairmanship of former House Speaker Newt Gingrich and former Clinton Director of Central Intelligence R. James Woolsey, the Secure the Grid Coalition has been active in educating lawmakers and their constituents about the nature of the various threats to the nation’s bulk power distribution system, including but not limited to EMP. Among other efforts in that regard was influential testimony provided before the House Homeland Security Committee earlier this year by two members of the Coalition: Dr. Peter Vincent Pry, of the Congressional Task Force on National and Homeland Security, and Dr. Chris Beck, Vice President of the Electric Infrastructure Protection Council. Yesterday, the House of Representatives took an important first step towards protecting America’s electrical grid – and millions of its people whose lives critically depend upon it – from attack or naturally induced destruction. That planning will hopefully make clear the necessity of taking steps to secure the grid before these things happen, rather than try to cope with the consequences afterwards. Educate yourself on this critical topic by reviewing our Blob Posts and the materials at securethegrid.com. Of course, at this time of Thanksgiving, we should first pray and thank God that we haven’t been hit so far (with either a successful terror attack or natural disaster), asking His mercy to protect us as we take action to secure the grid. 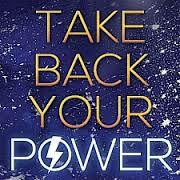 Exclusive new TBYP clip (http://takebackyourpower.net) on energy technology suppression. Are 'smart' meters part of history's largest ever corporate scam and suppression campaign? Josh del Sol, creator of Take Back Your Power , discusses how you can help quicken the breakthrough energy technology movement, by simply declining a 'smart' meter on your home, and helping others become aware. Dramatic Increase of Breast Cancer in Troops and Supposedly Smart Meter are safe?